One of the technologies introduced on the LX570 is Crawl Control, which takes hill descent control several steps further. With the rollover sensing system turned off and 4-Wheel-Low range engaged in the two-speed transfer case, the driver can then activate the Crawl Control system by choosing from one of three speeds the system will allow…The vehicle will maintain in the preset speed (1, 2, or 3 mph) going downhill or uphill, in Drive or Reverse, and will stop working whenever the brake or throttle pedal is touched, but comes right back on whenever the pedal is released. For now, this is the best there is in luxury SUVs. 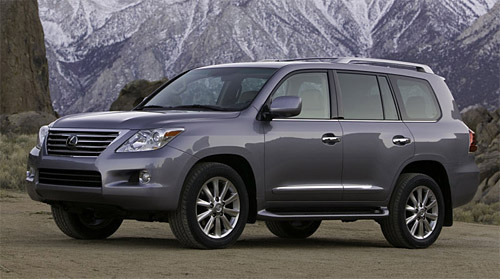 In my mind, the LX 570’s design doesn’t stand out like the LX 470, but it’s hard to fault the vehicle’s capability. It will be interesting to see if this level of approval keeps up as more reviews come in.